I slept horribly last night, but as I’m still awake, I apparently got enough sleep. I went to bed, did some reading, tried to sleep and had some really anxious thoughts run through my head, and then tried to do some more reading. I finally got to sleep around 2AM, but I was up to go to the bathroom a lot more than usual, and had some weird dreams. Even still, once my alarm clock went off, I was awake and that was that. Beyond that, I again have nothing new to report. No work, just chores, and tomorrow will be more of the same. I probably should have opted out of NaBloPoMo this year, but I had no way of knowing how much I’d end up distracted from posting. And with that, I’m done for tonight. Another kinda nothing day. Worked only 5 hours. Came home and helped out a little with the lawn Christmas decorations. Visited Mom. Watched Supergirl (with it’s weak connection to the rest of the crossover). Now. Thirty-four words is all I can come up with right now. I’m grasping for more, and there’s really nothing more I want to write about. I feel like I have major writer’s block, but really, I just haven’t been doing anything gaming related, which is the focus of the blog. That’s all. I refuse to keep fighting this today. I’ve really nothing to write about tonight. I dug a little deeper into the Moorcock book, and it reads like it was written by a 15-year-old (which it was). I was in bed in the wee hours, slept until late in the morning when the Christmas decorating woke me up indirectly. I went shopping, came home, took care of a few chores, and spent the evening dinking around with my laptop. Not really productive today. I have to say, I feel with all the tumult of this year, I’ll be glad when this month (and year) are over. I just haven’t been particularly focused on this project. The deaths and illnesses have been a cause of that distraction, as has the prospect of running a game in a couple of weeks. The election only added to the confusion. It just seems my mind has been under assault by reality all month. So, that’s it for tonight. I work tomorrow, and I have laundry to finish, so I’m done. Yesterday, after visiting Mom and a quick stop at HTU to pick up the new White Dwarf, I went and hung out with the Framily. After dinner, we watched some Doctor Who, particularly the episodes The Day of the Doctor, The Time of the Doctor, and Deep Breath. These were the transition episodes between Matt Smith’s Doctor and Peter Capaldi’s Doctor. What stands out for me is the care they take of their universe and the use of recurring characters and species. Like Star Trek, the writers have a setting they curate, not just a collection of weird stuff they string together. I really enjoyed seeing the strings in those episodes that connected to other episodes I’d seen here and there. Good stuff. When I got home, I had received a paperback I’d bought on eBay. 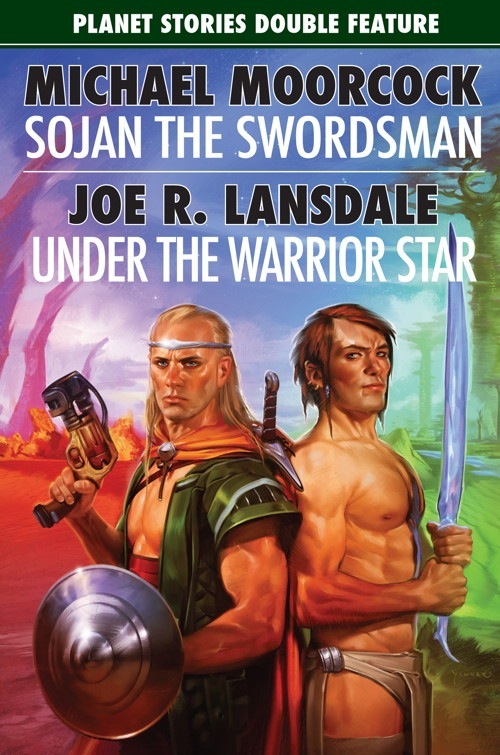 It’s available from Paizo: Sojan the Swordsman & Under the Warrior Star. I bought it for the Sojan the Swordsman portion, as that was authored by Michael Moorcock. I read the stories years ago, but I didn’t have a paper copy anywhere. In fact, I thought they’d been serialized in the Kane of Old Mars books I read in college, but the set I purchased earlier this year did not include the Sojan stories. Today, I spent some time over at the Framily’s. We all went to dinner, and then to see Fantastic Beasts and Where to Find Them. Very entertaining. And somewhat inspiring. It answered some the questions someone familiar with the Harry Potter series might have about how the Wizarding World, like why magic is hidden from muggles. And since there is more interaction between wizards and muggles, there is a certain Mage the Ascension feel to the whole thing, even though Paradox has no place in that world. I could see using this movie as the basis for a campaign. So, that’s the recap of the past couple of days. Later. A few days ago, while taking the dogs out, I noticed a couple of tubs of stuff left behind by Roger were teetering. As I actually had a day off, I cleaned those bins out. It’s amazing what people will pack, and how they’ll pack it when they’re in a rush. A musical recorder/flute case without a recorder. Two crock pots amongst clothes, as well as camping gear. The mind boggles. Mom was able to come home for Thanksgiving dinner tonight. Once I get her back, I’m planning on doing a little work on some minis I bought a couple of months ago, and that’s my night. No work tomorrow (so far), so I’ll spend most of the day with the framily. That’s all for now. Later. I work one of the shops yesterday. Sometimes the fleet distribution drivers need to sub for an office hiker; yesterday was one of those days. I got some (most) of my re-read of Fantasy Age complete while waiting around for driving work. Today I was chase driver most of the day. That means I picked up the others when they delivered cars, or took them to the location they needed to pick up at. That means I have to focus on driving and I can’t listen to podcasts. I work again tomorrow. I’ll finally have a good sized paycheck again, as I’ve worked three days on this pay period. I think tomorrow will be on the next paycheck (and yeah, that will be four days this period) or they’ll estimate and pay us the underpay on the next pay check. Anyway, I’m doing a lot of driving with little time for anything creative. Which means I’ve got nothing right now. GAH! I’m at that point where I’m tired, but wired on Mountain Dew so I’m not crashing. Today was a long day of work followed by what turned out to be our penultimate D&D 4e game. Which I’m fine with, as it gives me more time to review the Fantasy Age rules. Working tomorrow, so I’m out for tonight. Later.